Replying to an allegation by the Peoples Party of Arunachal Pradesh ( PPA ), the Arunachal Pradesh Bharatiya Janata Party Chief Spokesperson & State Vice President Dominic Tadar stated that the PPA Legislator of 20th Tali Assembly Constituency Er. Markio Tado was personally invited by the State BJP President Tapir Gao to attend the Tali Maha Development Rally on 30th October,2017 which was attended by the Chief Minister Pema Khandu, MoS Kiren Rijiju and Tapir Gao, State BJP President. The press statement issued by Dominic Tadar said that ” The MLA was persuaded by the State BJP President during the last State Assembly session on wards and later, he was invited to the State BJP office and wherein ,he came and agreed to participate in the said rally. The team comprising of the Chairman organising committee, District BJP President and Mandal President of Tali area met him and briefed him about the programme with an invitation to join, as it was a development Rally, mentioned in the statement. Even on 30th morning State BJP President Tapir Gao invited the MLA to accompany them in the chopper carrying the CM, Union Minister and Tapir Gao himself for the Rally- also mentioned in the statement. Meanwhile the BJP press statement explain that ” The purpose of Maha Rally organised by the Tali people along with BJP was to apprise the long untold sufferings of the people of Tali which remains unconnected by road till today and to bring to the notice of CM, Union Minister and State BJP President of the present Tali scenario of development. The statement said that ” The allegation by PPA of insult and humiliation of local MLA is very unfortunate and BJP always expect positive criticism from the responsible opposition party and allegations of wasteful show of strength of state resources to undermine local MLA is unusual ,instead, the party should have extended full support for the development of the most underdeveloped assembly segment in the state. The PPA should rather appreciate the CM and Union Minister for practically taking stock of the present developmental scene at Tali, mention in the statement. 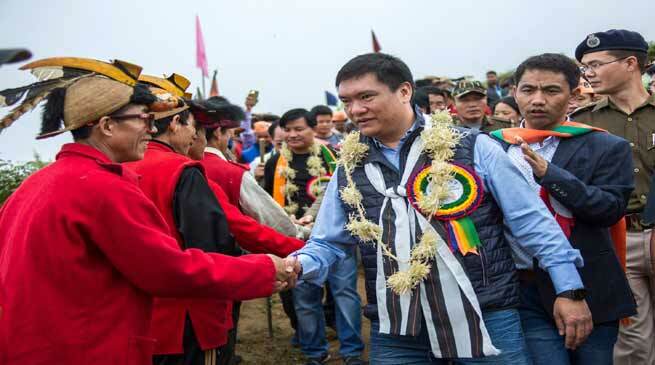 The commitment to restart the Tali-Yangte road by this month of November and sanctioning of Rs.5 crores to complete the bridge over Kumey river and promise to connect Tali with road immediately by the young Chief Minister Pema Khandu is a huge relief for the entire Tali region, as the HQ will be connected by road for the first time. As a follow up action,the young CM has called the Chief Secretary Shri Satya Gopal the next day itself and instructed him to take up the work of Yangte-Tali road on top priority- said the statement. Again, questioning the presence of Union Minister Kiren Rijiju is another surprising Issue, he being the local MP and the representative of people has every right to hear the problems of the place and his presence should have been highly appreciated and utilised to change Tali.